Our latest intallment of Royals Insider focuses on offseason acquisition Miguel Olivo. Is the 29-year old Miguel Olivo primed for a true breakout season in Royal blue in 2008? Projected as good enough to provide meaningful competition to John Buck in Spring Training, he will provide enough motivation for Buck to step his game to the next level as he enters the prime of his career. A solidly built but not overwhelmingly large right-hander, Olivo was signed as an undrafted free agent by the Oakland Athletics in 1996, and in mid-2000 was traded to the White Sox in a move that sent submarine reliever Chad Bradford to the Athletics as Billy Beane's Wonders geared for the playoff run. Interestingly, both teams ended up winning their respective divisions, the AL Central and the AL West. 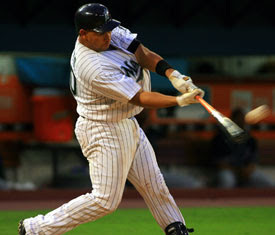 In 2002, Olivo had spent nearly five seasons slowly climbing his way up the A's and White Sox organizational ladder, showing excellent batting average, defense, and power early on, stalling somewhat, and then finishing 2002 strong with the Birmingham Barons, posting a .306/.381/.479 line in 108 games before being promoted to the White Sox in September. Initially, Olivo struggled as a catcher receiving 3/5 of the playing time, often playing second-fiddle to the veteran Sandy Alomar, who posted similar offensive but superior defensive numbers, during the stretch run in 2003. The White Sox lost the division to the Minnesota Twins in the final week, and their divisional loss inspired the White Sox to part ways with the right-hander as a starting catcher. After posting a far-improved .270/.316/.496 line in two months as the White Sox platoon catcher, General Manager Kenny Williams viewed him merely as tradebait, swapping him to the AL West-leading Mariners for fellow backup catcher Ben Davis and then-frontline starter Freddy Garcia. Olivo played mostly as a backup for Bob Melvin's Mariners in 2003 and 2004, posting a mere .648 OPS in the final months. Olivo would then spend parts of the next year with San Diego and Seattle, posting jekyll-and-hide numbers with both teams, respectively, before being signed by the rebuilding/overhaul ing Florida Marlins in the '05-'06 offseason. He hit .727 and .667 OPS-es in both seasons, showing considerable power against lefties but struggling against righties. Although the financial terms of his current contract haven't been disclosed, Olivo will probably earn over $2 million with the Royals this season, playing a primarily back-up position to John Buck. Hopefully, Olivo will start often against lefthanders and will show the arm that he was blessed with earlier in his career. Given that he is entering his age 29 season, he's a safe bet to continue, or possibly improve upon, his production in Florida. Moving to a more hitter-oriented park in Kauffman Stadium might lead him to repeat the respectable numbers he posted at Comiskey/U.S. Cellular in Chicago. He will have to improve upon his 7 and 12 passed balls he committed at Dolphins Stadium. - Hits finesse and groundball pitchers slightly better, which correlates well with Buck's ability to hit fly-ball and power pitchers. Miguel Olivo will likely improve slightly upon his numbers from 2007. He’s a safe bet to post at least a .400 OPS, especially in the doubles and HR friendly ballpark. He has experience catching Gil Meche. His hacktastic approach at the plate hinders his overall game, but the weakness could be overshadowed somewhat by his considerable power. Given the number of left-handers in our division (Dontrelle Willis, Kenny Rogers, C.C. Sabathia, Cliff Lee, Mark Buehrle, Jeremy Sowers, Nate Robertson, Johan Santana, Francisco Liriano, and more), his strengths could be emphasized even more with playing time against them. In the spring, Olivo will hopefully motivate Buck to secure that starting job once and for all, because Buck is the superior talent. Olivo provides above average production for a backup catcher. Probably because Buck has taken so long to develop and he’s still a remnant of the Beltran trade, hopefully Buck will improve upon 2007. I’m glad to have Olivo on board as a backup catcher.